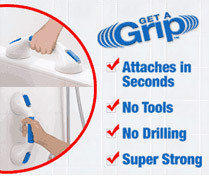 Summary: The original Get-A-Grip is the revolutionary new way to have a secure grip whenever you need it. The two powerful suction grips are strong enough to provide the grip you need to securely enter or exit the bath tub or shower, or just about anywhere you need a hand. It’s just as easy to remove as it is to install. To remove the handle, just unlock the switch and now you can move it to any location. Now you don’t need to drill holes in your wall just to give you the peace of mind of a secure handle! Supplies are limited – Order Now!